Braxon expertly cleans and beautifies your fine oriental and wool rugs. They need to be appreciated and looked after with tender loving care. If they are properly maintained, rugs will last a lifetime and longer, thus allowing them to be handed down for generations to come. 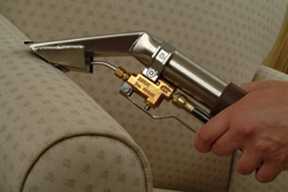 Upholstered furniture cleaning is a very specialized craft, with great emphasis on detail. Modern upholstery fabrics require special equipment, techniques and drying times. Therefore, a cleaning professional, who knows and respects these fabrications, is best suited to treat them. They require specific and consistent cleaning procedures to bring them to their optimal appearance levels. Originally founded in Quebec in 1961 (working under the banner of a major cleaning franchise), the company has evolved into one of the most advanced commercial carpet maintenance companies in North America. In 1999 we made the transition from a franchised carpet cleaning business to an independent carpet maintenance company -Braxon. Since then we have gained the respect and confidence of major carpet manufacturers and prestigious firms in our marketplace. We can boast the highest success rate in the field because of the dedication to detail and our focus on customer satisfaction. We specialize in the cleaning of carpets, upholstery and fabric dividers in the office environment. Many years ago we took the initiative and began to experiment with our cleaning techniques and our approach. We realized that to be the best we needed to concentrate in one field and not try to be everything to everybody. We chose to focus our efforts in the commercial field and, specifically, in the office environment. Many at the time considered us outcasts, but we stayed the course and honed our skills. Now that “commercial” carpet cleaning and maintenance is beginning to be addressed, we, at Braxon are well positioned in the marketplace. All our programs are tailored to the individual consumer using a variety of techniques to give the best possible results for the money invested. Our reputation has been made and we will jealously guard the sacred trust given to us by our clients. Our custom made cleaning agents are safe on carpets but tough on dirt. When we chose to specialize in commercial carpet maintenance and cleaning, we tried unsuccessfully to find the correct types of cleaning agents that were conducive to our preferred method. Therefore, out of necessity, we developed our own line of environmentally friendly cleaning agents and the rest is history. Since then, we have become the cleaner of choice for many; including manufacturers, dealers and property management companies in addition to solidifying our position with our Fortune 500 clients. Our system uses a fraction of water others use. Our Low-Moisture System uses much less water than our competitors. Consumer consumption of water is playing havoc with water tables and we at Braxon are doing our part as concerned citizens to help conserve water all year round. In addition, our method means that we do not pour “dirty” water down drains to further pollute the environment. The carpets DRY FAST – down time from wet carpets is eliminated. Your carpet is barely damp when using the Braxon Low-Moisture System and is usually dry within one hour. Compare this to the hot water extraction method that takes from 4 - 24 hours or more to dry. Excess water causes wicking. As the carpet dries the water “wicks” up any soil that had not been removed – at any level – to dry on the surface. When a spot reappears two or three days after the carpet has been “cleaned” you now know how long it took to dry completely. According to the British Allergy Foundation, our vacuums are practically emission free – a real benefit for customers with allergies or asthma. S-Class Filtration – In tests conducted independently by the German SLG Institute, the SEBO automatic X was shown to filter greater than 99.9% at 0.3 microns particle size. For particles of 1 micron and larger, the filtration rate is 100%. We take pride in our knowledge of how soiling occurs and how to deliver the best possible appearance levels. To accomplish this we have ongoing training programs and have developed maintenance plans, using varied but uniform techniques that will allow the carpet to never be out of service for any great length of time. In most cases, the carpet will be back in service in less than one hour. Our technicians receive a thorough education on how to use our own line of environmentally friendly cleaning agents, which are especially designed for commercial use. The equipment allows these products to work to their maximum capacity. As always, we start with the least aggressive methods and proceed, using more aggressive procedures until a determination has been made that the spot has been removed, it is permanent or that fibre damage will occur if we continue. We recognize that our clients view security issues as having the utmost importance, and to prove how seriously we have taken the issue, all our technicians have passed their Enhanced Reliability Clearance. This, coupled with our training, makes our technicians the best in the industry. We are “authorized and recommended” by the biggest and the best carpet manufacturers in the industry. We are an “AUTHORIZED” cleaning company for Shaw Commercial, Patcraft and Design Weave and as such can perform all warranty work for them. As well we provide custom maintenance programs for their newest installations so all warranties can be kept in place – a real benefit to the end user. In addition, Beaulieu Canada uses and recommends us for maintenance related issues. When compared to either our competition or replacement costs. When using Braxon our dedication to detail really shows. During our history we have really become efficient; therefore, our prices for superior cleaning are lower than most charge for mediocre cleaning. We really do give true value for money invested. 10. You Will Look Good! If you need one more reason – we will make you look good. Braxon uses very little moisture in the cleaning process, thus dirt and spots cannot “wick” back to the surface. Our cleaning agents dry to a crystal and leave no sticky residues; therefore carpets will stay cleaner longer. When that happens the building looks better, the employees feel better and everyone knows you made it happen. Truly, a win-win situation! !